The mission of Circle Center is to keep families together by having a safe place for older adults to be during the day while their family members work or receive that needed respite. Because we get to know our participants and the activities and care provided is so person-centered, we often get to know the very individual details of someone’s history. Our community is woven with unique histories and we want to acknowledge the successes and struggles that our participants have been through during their lives. We take pride when we are able to provide them with the services that complement that history and their needs as they age. We also serve as a healthy and healing place for those who have been through physical and emotional trauma. Meet Alan Zimm, our 98-year-old participant who has lived in Richmond for decades, but is originally from Poland and is a Holocaust survivor. During our reminiscing group at the Center one day, Alan told his peers about the challenges he faced as a young man. One of 10 children, Alan was taken captive along with members of his family and transported to a concentration camp named Buchenwald. Although he was separated from his brothers during his imprisonment, they were at the same camp and endured the same atrocities. The majority of Alan‘s family was killed during the war; he and his brother Solomon were the only two survivors. Upon returning to Poland he was raised in his family home in his hometown, Kolo. He has fond memories of being raised among many pets including horses, german shepherds, ponies and canaries! At their home site in Poland, they grew produce including vegetables like cabbage, potatoes, as well as fruit trees with apples, pears and plums. It was in Poland that Alan met the love of his life, Halina. In 1948 they were married in Germany. They lived there for three years in order to obtain a sponsor and visa to come to America legally. The Jewish women’s organization in Germany helped them to legally travel to America and in 1952 Alan, Halina, and Solomon arrived in Richmond, Virginia. Alan and Halina became parents to two sons and two daughters. Halina enjoyed speaking at women’s clubs and Alan begin his own tailoring business in Richmond. Alan said with his still thick Polish accent, “Our shop would make men’s suits, slacks and ladies suits, skirts and dresses.” Alan shared that his favorite part of being a tailor was “using the sewing machine” and “I also created one or two of my very own designs!” he said with a proud smile. 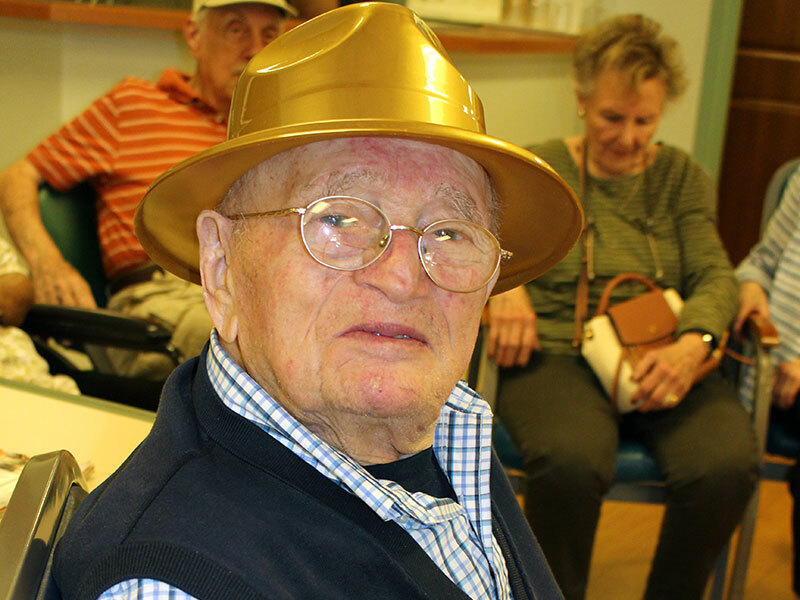 At Circle Center, Alan enjoys socializing with other participants and staff as well as keeping fit with our wellness activities!